“What about that boy?” asked Li Cunxin’s teacher. This sole question changed Li Cunxin’s life from a childhood of poverty and deprivation to a student in Madame Mao’s Dance Academy in Beijing, China and, eventually, to world-wide fame as a ballet dancer. Written from his heart, Li relates his life story using vivid descriptions, details, and vignettes. Li’s story is one of inspiration, courage, self-determination, and passion. It’s also about homesickness, deprivation, and loneliness. Li was born in 1961 and grew up in great poverty during Chairman Mao’s Great Leap Forward. Nearly thirty million people died during this time of great starvation, disease, and deprivation. Life in the commune was dictated by the government and announcements were broadcast over the village’s loudspeakers. Li is the sixth of seven sons born to his beloved Niang and Dia in the remote Li Commune. School lessons were very rudimentary. Children were required to memorize Mao’s Little Red Book and were taught to love Chairman Mao. The book portrays the stark living conditions of Li’s family. Li’s parents, his beloved Niang and Dia, and their seven sons lived in four rooms which consisted of two small bedrooms, a larger bedroom, and a combination kitchen and living room. The family did not have running water, refrigeration, or a bathroom in their home. Although everyone in the family worked hard, they rarely had enough food to eat. Li’s Niang and Dia taught their children that the family name was sacred and should be guarded. This lesson was to serve Li well as he was plucked, at the age of 11, from his village to be a ballet student in Beijing. Life was harsh during Li’s seven years in Beijing. He was very homesick for his Niang, Dia, brothers, and extended family members. The discipline was severe and the students practiced for long hours each day. Through determination, resolve and perseverance, Li realized he was passionate about ballet and he developed into a promising ballet student. Then, one day, his life changed again when Ben Stevenson the Artistic Director of the Houston (Texas) Ballet chose Li to spend a summer studying ballet with his company in America. In Houston, Li was astounded by the contrasts between his life in China and Houston. As he continued to develop as a dancer under Ben’s coaching, he began to doubt his education and obedience to his childhood teachings. Through a series of events in Houston, Li defected from China to the U.S. For a brief period of time, he was detained by the Chinese Consulate in Houston. Through the intervention of U.S. Vice President George Bush, Li was released by the Consulate. During most of the years he lived in Houston, he was not allowed to see his beloved family in China and was eventually reunited with them. Li’s life continued to change. He went on to world-wide fame which included a very successful career with the Houston Ballet and, eventually, as a principal dancer with the Australian Ballet. Eventually, Li retired as a ballet dancer and he currently lives in Melbourne, Australia with his family. 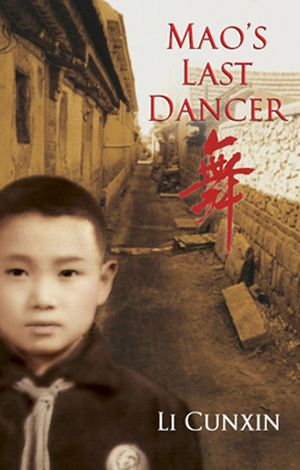 “Mao’s Last Dancer” is a must read for individuals who are interested in dance, talent development, Chinese history, family relationships, and autobiographies. Months after reading the book, it remains vivid and unforgettable. Li’s story is compelling and extraordinary! Prof Libby G Cohen is a visiting scholar. She is passionate about improving the lives of children, youth, and adults with disabilities and is especially interested in teaching methodologies, universal design in education, and using technology to facilitate teaching and learning. She was awarded the title of “Professor Emerita” by the University of Southern Maine in the United States. She is the author of grants that have funded a number of technology projects that facilitate the participation of children and youth with disabilities in science. She has been funded by the National Science Foundation, National Aeronautics and Space Administration, US Department of Education, Mitsubishi Electric Foundation and others. She also has served on the editorial boards of three respected journals. I couldn’t agree more with this line from the review: “Li’s story is compelling and extraordinary!” I am so blessed that Libby was so generous enough to lend this book to me – I am halfway through, stealing a few chapters here and there while I can – and I’ve been sniffling through some of the earlier parts, particularly when he left his family for the first time at age 11. I can not help but be amazed by how strong and steadfast his character is. What is even more amazing is the warmth and love that he felt from his mother who had to fend for seven boys, feed her family, and work in the fields as well. This book, undoubtedly, is a must-read. I also got a copy of the film from a friend, I am looking forward to watching it as well.